1. a linen-finished gingham cloth with a white weft and a colored warp, producing a mottled appearance. Who writes dictionaries anyways? 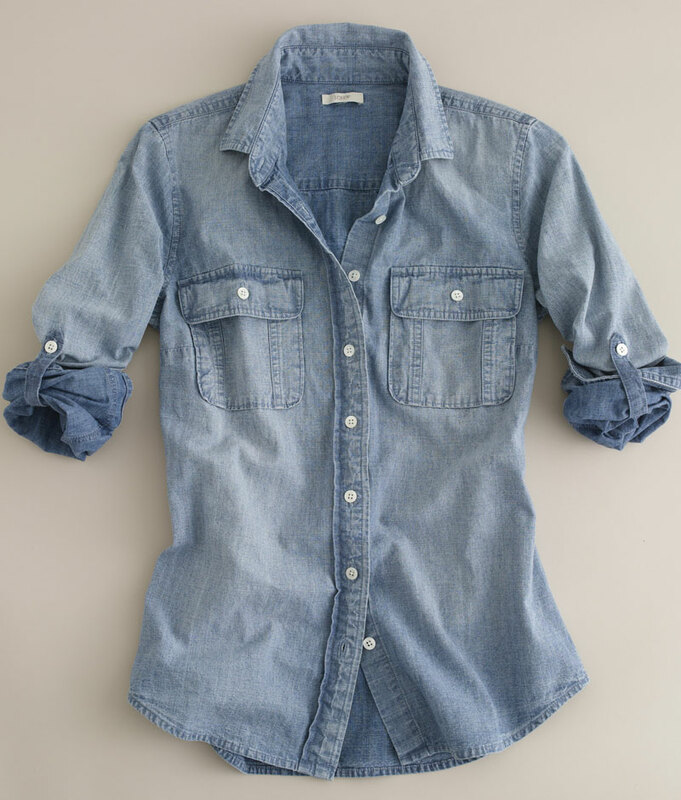 A chambray shirt is a denim shirt, a jean shirt. Got it? Good. Let’s talk about it. Then wear it…to work, to the bar, to the zoo, on a date, to bed (after a few drinks), to the movies, anywhere, everywhere and I’ll show you how! I think everyone should own one of these, and keep it forever. My best friend’s Mom has literally been rocking this style from when she was yelling at us for eating all the ice cream (we were 5), to yelling at us for sneaking out to party (we were 15), to yelling at us for eating all the ice cream after getting back from partying (we’re 28). I went from loving it to hating it to loving it AGAIN. Like most styles this will go in and out, but right now it’s IN and regardless I think it’s a classic staple to add to any wardrobe. Wait. What? I can wear denim to work?? YUP. Well, assuming you’re not a hoity-toity lawyer or lion tamer or something. Let me just say first that I LOVE scarfs. It’s one of the only things that makes me feel okay about it getting colder out. They can make any plain outfit look like a put together decision that must have taken hours to determine, when in reality you took about 30 seconds to wrap it around your neck. That’s the secret here people, basic, well-fitting pieces with one or two accessories that make the ensemble POP. 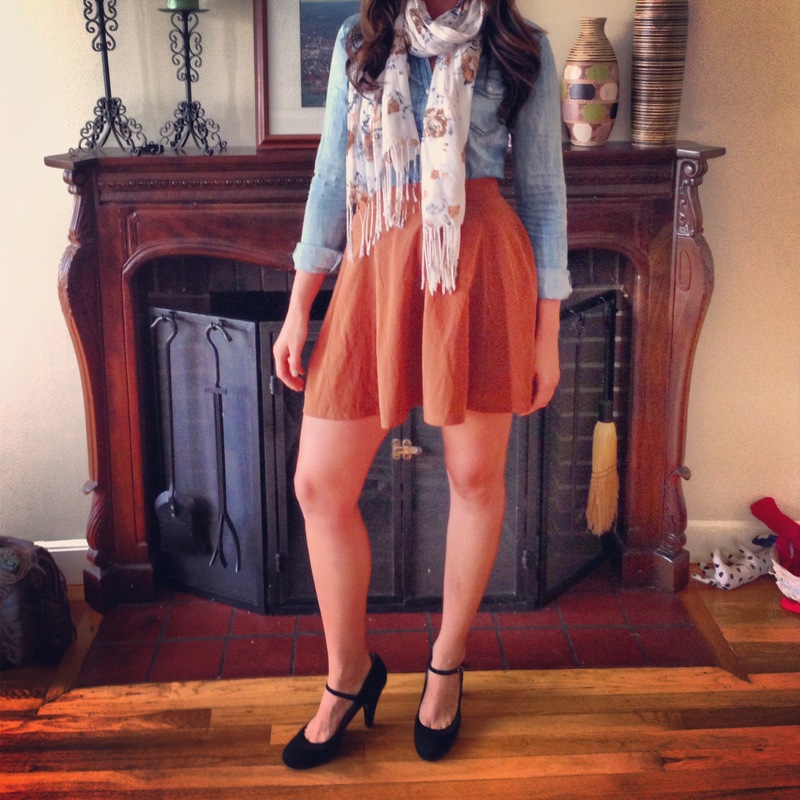 Chambray Shirt + A-line Skirt + Floral Scarf + Mary-Jane Heels. This is a good outfit to wear on a date, out to a cafe in the late afternoon, or to the pub for a couple beers (or on a date that goes well at the cafe and is followed up by beers at the pub). And guess what, it’s comfortable too! I tucked in the front of the shirt and left the back untucked for that “this is a casual outfit with a little sassiness” look. That’s exactly what you thought when you first saw it too, right? YESSS, NAILED IT. 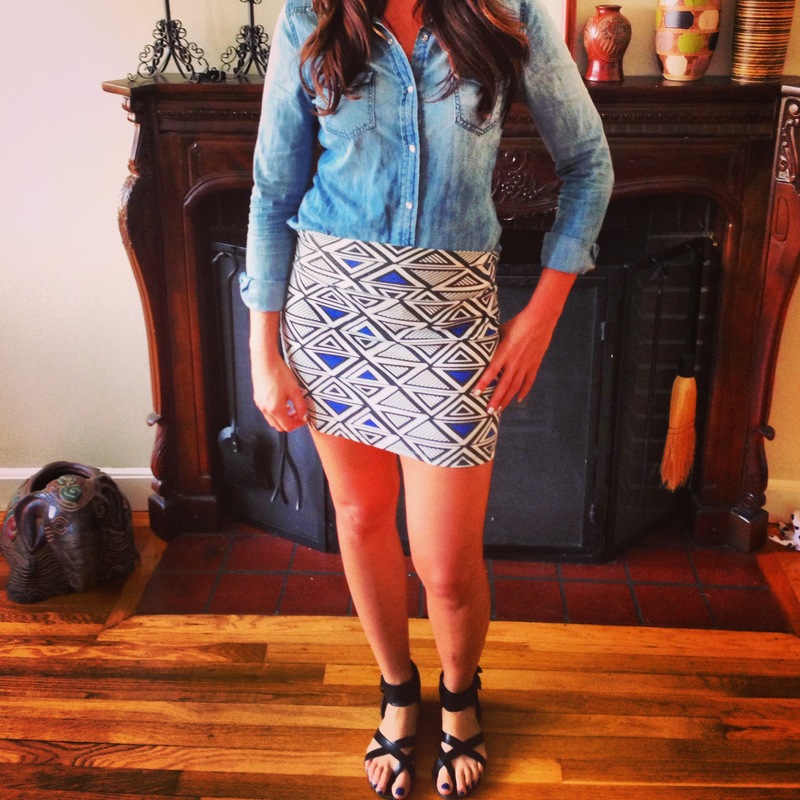 Chambray Shirt + Tribal Patterned Mini Skirt + Gladiator Sandals. This outfit is COMFORTABLE. And if you’re a single lady like myself you may get hit on more in this outfit than the other two because of the bizarro obsession men have with yoga pants. I think the lace cami adds a little bit of pizazz (does anybody under 90 use that word?) to this look as well. 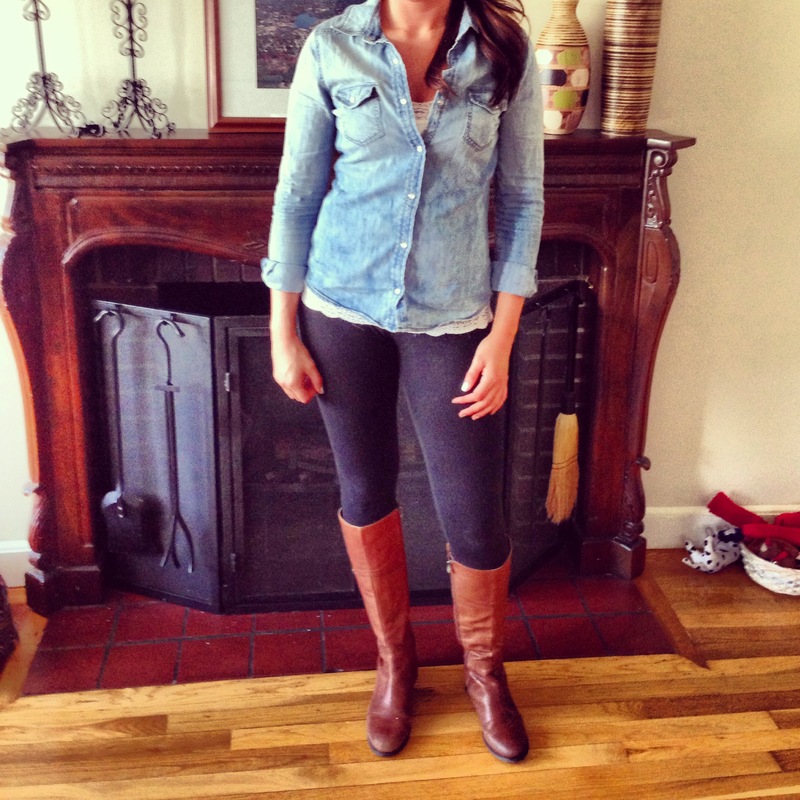 Chambray Shirt + Cream Lace Cami + Black Leggings + Chestnut Riding Boots. PS – I bet you are all wondering what amazing photographer I used to take these photos? Oh you’re aren’t? You can tell I took crappy photos with my iphone and then instagrammed them? WELL that’s because I want this to look as natural as possible, I want to show attainable looks for the average, everyday woman. Inspire looks with clothes that most already own, but may not have thought to put together in that way. Because I could easily afford a famous photographer ya know. I’m rich. I have a butler and a maid and sleep on sheets made of gold (wait…that actually sounds uncomfortable). Can’t you see I’m posting these “awkward in front of the fireplace mantel” photos for YOU. So, in all seriousness, I hope you were inspired at least a little bit, so go out there and Get Your Chambray On….literally. Very stylish and great advice! Post more soon! mooooore. i want moooore. love your writing style, you funny b*tch! You are so stylish! You should give out consultations at work! Love this concept – so simple but who couldn’t use these tips? !